Silver Spring, Md. (Wednesday, September 26, 2018) –In celebration of National Manufacturing Day, Arconic Foundation, the independently endowed philanthropic arm of Arconic, Inc., and Discovery Education, the leading provider of digital content and professional development for K-12 classrooms, are hosting a Manufacture Your Future Virtual Field Trip from Arconic in Austin, Texas on Friday, October 5, 2018 at 1:00 p.m. ET/10:00 a.m. PT. During the immersive virtual experience, students will explore how 3D printing is shaping the future of manufacturing and meet Arconic employees who are using this cutting-edge technology to build high-performance aircraft parts. Educators, classrooms and communities may register for the virtual field trip at ManufactureYourFuture.com. Manufacture Your Future, designed by Discovery Education’s curriculum experts for 3rd– 12thgrade students, offers educators, guidance counselors and families, hands-on resources that build excitement around post-secondary manufacturing career opportunities. Comprehensive, cross-curricular lesson plans range from a look at the history of manufacturing to STEM-based interactives on robotics, and are designed to stimulate insightful conversations between educators and students. The program’s family discussion starters extend the conversation beyond the classroom, giving parents a way to highlight the crucial role that manufacturing plays in day-to-day life. As manufacturing continues to evolve and require 21st-century skill-sets, employers have continued to develop a pipeline of qualified workers who are passionate about the industry.Manufacture Your Futureempowers educators to connect to classroom-based STEM lessons and enriched, real-world career experiences. These experiences provide students with opportunities to gain valuable workplace skills prior to graduation. The initiative encourages the development of critical thinking skills through real-world applications. Available at no cost to classrooms nationwide, the comprehensive program offers standards-based resources focused on STEM; lesson plans; a manufacturing career guide; family discussion starters; and virtual field trips to give students an up-close look at some of today’s most prominent manufacturing careers. Every year during National Manufacturing Day, Arconic comes together with more than 1,600 manufacturers across the country to motivate the next generation of manufacturing leaders and innovators. Participants can join the celebration by sharing their Manufacturing Day ideas and inspiration with @DiscoveryEdon social media using #ManufactureYourFuture for a chance to have their classrooms featured during our virtual event. For more information on the program or to access the site’s free resources, visit manufactureyourfuture.com. 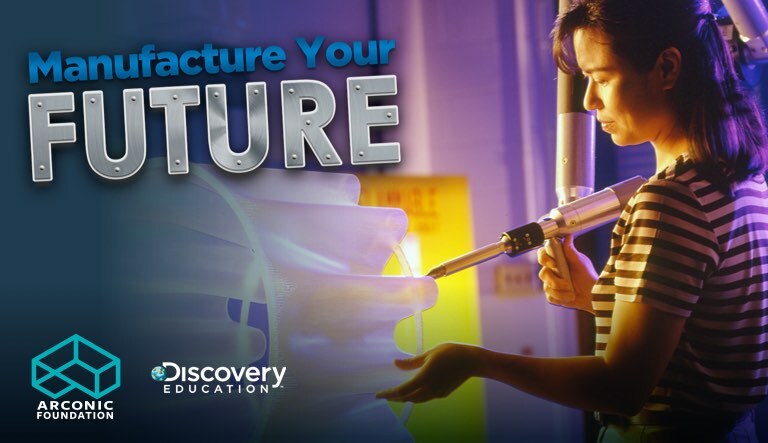 Manufacture Your Future materials are also available through Discovery Education Streaming Plus. For more information about Discovery Education’s digital content and professional development services, visit www.discoveryeducation.com. Stay connected with Discovery Education on Facebook, Twitter, Instagramand Pinterest @DiscoveryEd. Arconic (NYSE: ARNC) creates breakthrough products that shape industries. Working in close partnership with our customers, we solve complex engineering challenges to transform the way we fly, drive, build and power. Through the ingenuity of our people and cutting-edge advanced manufacturing techniques, we deliver these products at a quality and efficiency that ensure customer success and shareholder value. For more information: www.arconic.com. Follow @arconic: Twitter,Instagram,Facebook,LinkedInand YouTube.